Description: One of the easiest annuals to grow, Zinnias are highly recommended to the beginner gardener; but are also cherished by seasoned earth movers for their diverse colors, heights, and sturdiness in the garden. There are many types available to gardeners today, ranging from small single blooms on compact plants, to large showy doubles on 3 foot stems. They are an excellent choice for the cut flower garden, and an easy flower for children to grow. Spacing: Depending on variety, 6 inches tall and wide to 3 feet tall and wide. Bloom Time/Color: Mid-Summer to Fall. Every color imaginable, except blue. Pairs well with: Tall salvias for shape and color contrast, heat loving petunias, and fall bloomers such as Asters, Sedum and Mums. Tips and care: Zinnias prefer warm, well-drained soil, rich in organic matter. For bushier plants, pinch back young plants and/or cut blooms for indoor use. Remove spent flowers throughout the season to promote new blooms. Fertilize in mid-season to keep plants healthy and blooming. Currently: IN STOCK and 50% off!! 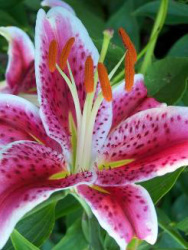 Description: The stargazer Lily was hybridized by Leslie Woodruff in 1974, and is now the most popular oriental lily in the world. Grown in gardens and/or for use as cut flowers, the perennial plant produces showy, highly fragrant flowers that grow well in beds and containers. They are sturdy plants that do not require staking and require little care in NW gardens. Bulbs and plants may be planted in Spring and Fall. Bloom Time/Color: Pink flowers with white edges and red or dk. pink spots. Pairs well with: Other spring and fall flowering bulbs such as Gladiolus, Peonies, and Dahlias. Consider pairing with Asiatic lillies for a show of color all summer long! Tips and care: Stargazers prefer moist soil and should be mulched to keep roots from drying out. If slugs become a problem, place saucers of beer under the plants to attract and kill the slugs. Currently: IN STOCK and 30% off!! Description: The Ribbon Bush is a terrific, leaf-less plant from the Solomon Islands in the South Pacific with long, flattened stems resembling tapeworms - hence its nickname "Tapeworm Plant". It's hard to capture the unusual beauty of this plant in pictures. You'll just have to trust us that this is an awesome, offbeat plant that will get people asking: "What the heck is that??" Ribbon Bush is considered a rare find in many parts of the US, and seeds are reportedly very hard to find. Pairs Well With: Bold-colored impatiens, dark colored leaves of Coleus and Heucheras, especially striking against the dark purple foliage of Strobilanthes. Description: New Guinea impatiens is a species of the vast genus impatiens, which flower in all colors (except true blue and yellow). The New Guinea impatiens was discovered on a plant hunting expedition to Southeast Asia. The growing habits of impatiens make them ideal low-maintenance plants. New Guinea impatiens form compact, succulent subshrubs with branches growing 1 to 2 feet tall by summer's end. Leaves are long and narrow, green, bronze, or purple. Flowers, growing up to 2 inches in diameter, are white, pink,lavender, purple, orange, and red. Tips and Care: Fertile, moist soil high in organic matter is preferred by New Guinea impatiens. They are more sun-loving than the other impatiens. They will tolerate more sun if their roots are kept moist. Incorporate a slow-release fertilizer into the soil before planting. They should only be planted after the danger of frost has passed and the ground has warmed. Size: 16" wide, 10" tall with a 24" flower stalk. Description: Heucheras have seen a dramatic rise in popularity in recent years due to new varieties and flower combinations. One of the more striking new varieties on the market is the 'Midnight Rose' Heuchera. The deep purple leaves with dark-pink speckles are very eye-catching and easily brighten shady areas. Pink speckles appear in spring and get larger as the season progresses, eventually fading to a cream color. Unbelievably showy, ‘Midnight Rose’ complements all surrounding foliage and flower colors while shining through as a showpiece in its own right. Pairs well with: Hardy Ferns, bold-foliaged Hostas, & deer-proof Hellebores! Tips and Care: Best grown in a hummus, moisture retentive soil. Once established, it can take on heat, humidity, even poor soil. Remove spent flower stems to tidy up the plant for the rest of the rowing season. 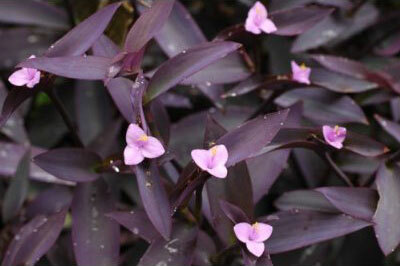 Description: Originally a native of Mexico, the Purple Heart is one of the top-rated plants for indoor growing. It also does well in beds, planters, hanging baskets, greenhouses, and as a groundcover. 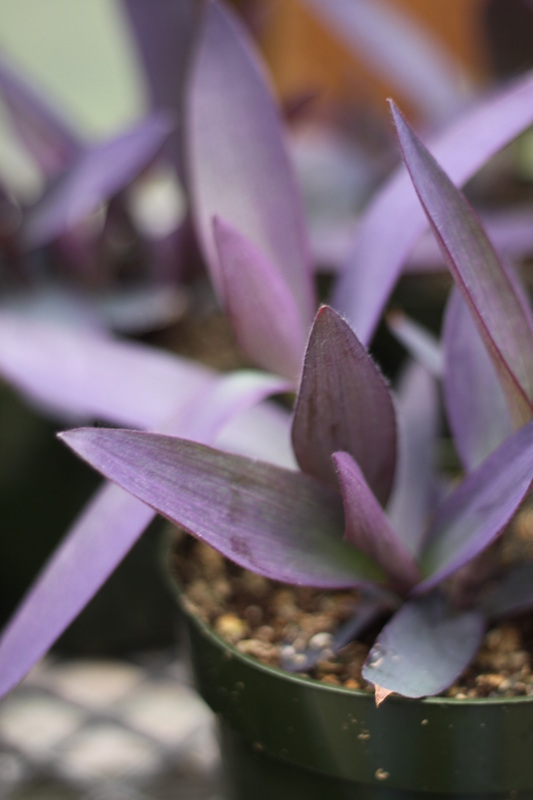 Here in Vancouver, the Purple Heart is an annual, but is easily propagated by stem cuttings for next years plantings, or can easily be brought indoors where it has been judged exceptionally effective at improving indoor air quality by filtering out pollutants and respiratory irritants. The whole plant is a deep, dusty purple with upright or trailing stems that produce 6" long leaves and pink-purple flowers. Pairs well with: Purple, red, and yellow flowering plants. Tips and Care: Mist occasionally with warm water (lime free to avoid leaf staining) and pinch back the tips to keep the plant bushy.